Yes, it’s a Late Arrival, this time for the Session. I never seem to notice the Sesh until it’s over; usually it’s no great loss as the topic doesn’t inspire me, but just occasionally a topic is right up my alley. As is this one: drinking in pubs alone. Conviviality, relaxation, spontaneity; these are some of the great things about drinking in pubs. These days I mostly seem to experience them alone. When I’m playing or singing at a folk club / singaround. The odd thing about these is that, although they’re usually held in pubs or clubs, they aren’t especially convivial occasions – or at least, the conviviality happens through the music; you don’t spend a lot of the evening chatting over beer. Musical sessions are a particularly extreme example – essentially, two hours of playing traditional tunes, pausing only to draw breath and take the odd gulp. With my family, usually having a meal, generally in JDW’s. Well, JDW’s, what is there to say? Excellent beer sometimes – but again, it’s generally not the most convivial of experiences. On work do’s. Nothing against a work do, particularly after the first pint or two. But I have got a problem with big gatherings in general, which is that I’m a bit deaf in one ear – so if the group, or the pub, is at all noisy I have to make an effort to keep up with the conversation, and don’t always succeed. Meeting a friend for a drink. This is the real deal in terms of conviviality, as long as nobody falls ill or throws a strop, but I don’t do it much; we’re talking number of times per year rather than per month, and they’re generally arranged well in advance. Also, the deaf thing is sometimes a problem. On Saturday nights, one pint before ordering our regular takeaway and another before picking it up. Good beer, leisurely early-evening weekend atmosphere and something good to read (usually the London Review of Books). Half an hour of mildly alcohol-fuelled semi-intellectual reverie and relaxation: bliss. On occasional weekday evenings after dropping my daughter at one of her regular activities (on foot, I hasten to add). Usually I turn round and go home again, but sometimes I stay out and pick her up afterwards, spending the next hour with a couple of pints of something decent and the London Review of Books. An hour of [see above], made a bit less blissful by slightly less relaxed mid-evening weeknight atmosphere (darker, noisier, busier). On occasional weekday afternoons when I’m not working (I work part-time), and I feel like celebrating or it’s hot or something. A leisurely pint, or sometimes just a half, watching the world go by and – just for a change – reading the London Review of Books. Again, the atmosphere falls a bit short of Saturday evening, for the opposite reason – it’s generally a bit dead (although not completely – I’m never the only person in there, and I’m usually not the only person drinking alone). On tickers’ pub crawls, e.g. Mild Magic or the Winter Warmer Wander. I really enjoy seeing a variety of pubs and getting to know different beers, and doing it on my own doesn’t bother me; I’ve always got something to read (it’s often the London Review of Books). You get the rough idea. Drinking isn’t really a social thing for me; by and large, it’s something I do alone in a social setting. I’m not totally anti-social – I don’t actually prefer newsprint to a chat with a friend. 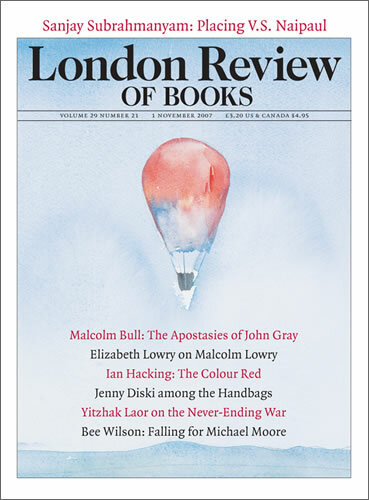 But if that’s not a possibility – which it quite often isn’t – a pint with the LRB isn’t a bad alternative.